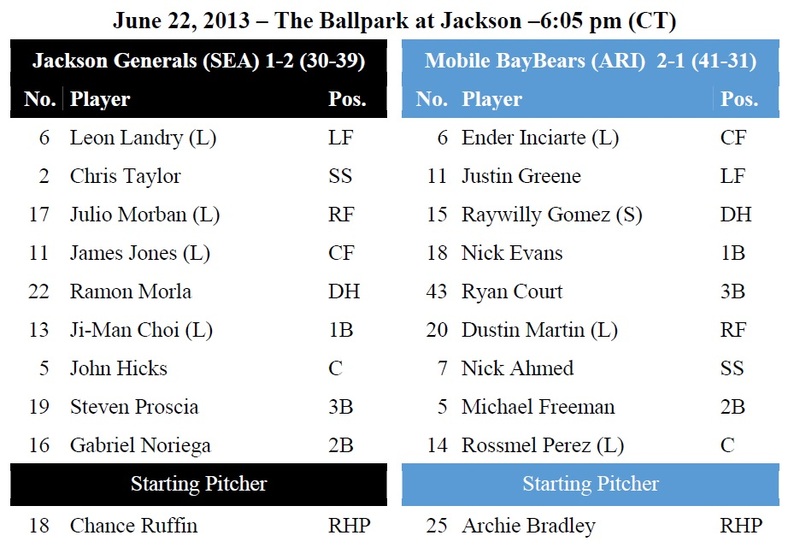 TODAY’S GAME: the Generals play game #4 of a 5-game series with the first half South Division Champion Mobile BayBears (1-2)…this is the 4th of 15 meetings during the 2nd half between the clubs…last season the Generals finished the regular season 6-4 against Mobile… 24-year-old Chance Ruffin makes his 13th career start and 13th of the season tonight. Ruffin has walked just 17 batters in 68.2 innings this season which ranks 5th in the SL in walkers per innings pitched. GENERALS RECAP: Mobile lefty Andrew Chafin tossed his first complete game of his career striking out a season-high 8 Generals in Mobile’s 5-1 win over Jackson Friday night. DH Julio Morban was 2-for-4 in the loss for the Generals and is now batting a league-best .322 on the season. LH James Gillheeney suffered the loss for the Geneals. YOU ALREADY KNOW…that the Generals face Mobile RHP Archie Bradley tonight, but DID YOU KNOW?…that Bradley is ranked as the No. 3 overall prospect for the Arizona Diamondbacks and was the 7th overall pick in the 2011 draft. Bradley turned down the chance to play quarterback at Oklahoma for a $5 million signing bonus from the Diamondbacks. NEWS & NOTES: 29 of first 69 games have been 1-run games (10-19) which is the most in all of minors…41 of 69 games have been decided by 2-or-fewer runs (13-28) and 6 have been extra-inning games (2-4)…In games decided by 3+ runs the Generals are 17-11. • TODAY’S TRANSACTIONS: LHP Anthony Vasquez has been promoted from A- Clinton and will replace Walker in the Jackson rotation. • ALUMNI REPORT: 2011 General Kyle Seager was 1×4 with a BB last night for Seattle and extended his hitting streak to 6 games with a single to RF in the 6th…during that period he is hitting .346 (9×26) with 4 runs scored, 3 doubles, 1 home run, and 3 RBI. 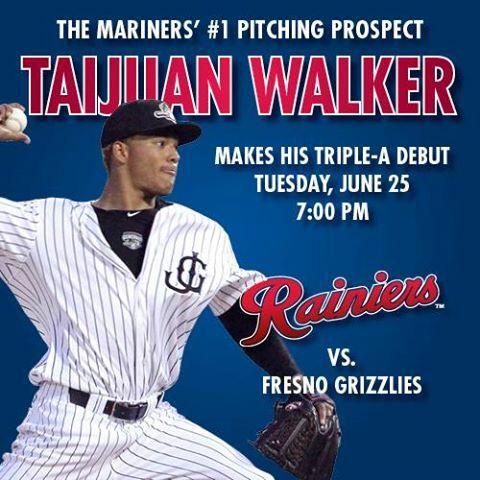 • NEW FRESH PRINCE OF TACOMA: RH Taijuan Walker was promoted to Tacoma Friday. He struck out a career-high 12 on Thursday against Mobile. In his last 5 starts, has struck out 39 and walked 5 in 32 2/3 innings, all while allowing opponents to hit just .191 (21-for-110). He’s now made 39 starts for the Generals in 2 seasons complete with rates of 9.1 strikeouts and 3.4 walks per nine innings. – Walker leads the league and Mariners’ organization in strikeouts with 96. – Ranks 7th in the league in ERA (2.46) and 3rd in IP (84.). Among SL starters ranks 1st in SO/9IP ration (10.29) and 3rd in opponents AVG (.195). – has allowed 2 runs or fewer in 5 of his past 7 starts, and he has gone at least 5 innings in every start except 1, when he allowed 7 runs over 4 2/3 frames at home to BIR. – The 12 K game vs. MOB marked the 4th time Walker, now in his 4th year of pro ball, struck out double-digit hitters. The previous 3 — all 11-strikeout games — came in 2011 in Clinton the year he was named the Mariners’ Pitcher of the Year. • FACING THE CHAMPS: The Generals are currently in a stretch of playing 10 straight games against the North and South Division 1st half Champions. Birmingham took 3 of 5 from the Generals to close out the 1st half and Jackson now faces Mobile during the opening series of the 2nd half. Mobile has won back-to-back SL Championships including the best-of-5 Championship series last year over the Generals in 4 games. • THE THREE CAVALIERS: With the addition of Chris Taylor to start the 2nd half, the Generals current roster features 3 former Virginia Cavaliers. AAA Tacoma’s roster features 2 former UVA alums in pitcher’s Andrew Carraway and Danny Hultzen. Both were 2012 Generals. • NORIEGA’S SPORTS CENTER LOVE: The 6-3 triple play started by Gabriel Noriega to end game one of Monday night’s doublheader against Chattanooga was Monday night’s #3 play on ESPN Sports Center’s top 10 plays. • SOLDIER ON THE HILL: After allowing 2 runs in his first relief outing on April 5, LH Nick Hill has allowed only 4 runs in his last 29.0 innings (1.24 ERA). Overall this season he has limited opponents to a .208 (22×106) average, while walking 14 and striking out 21. • WE GOTCHA! !…Jackson catchers lead the SL catching 48.5% of base stealers (32 CS, 61 Att). The next closest is Mobile which is throwing out 33.8% of base runners.